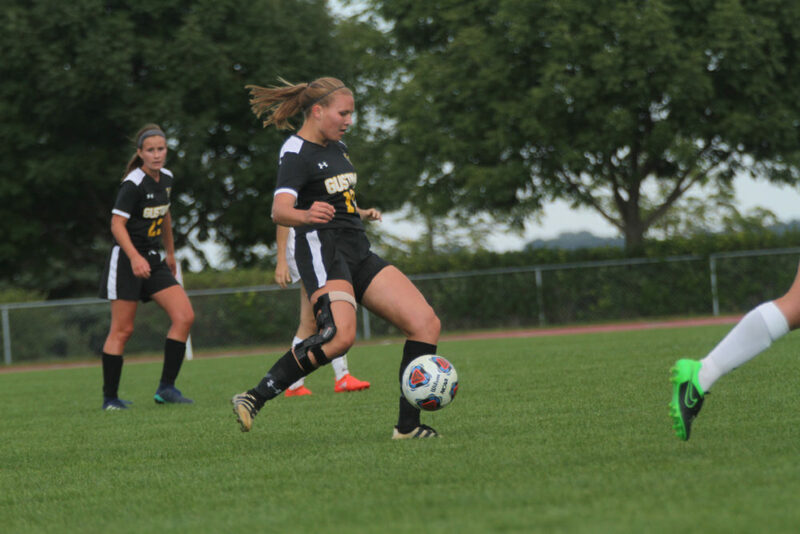 SAINT PETER, Minn. – The Gustavus women’s soccer team dropped an overtime contest by a score of 2-1 to Wartburg on Sunday afternoon. With the loss the Gusties move to 2-2 while Wartburg improves to 3-1 on the season. The game remained scoreless through the first half as both defenses held the opposition at bay. The Gusties struck first in the 64th minute when Abby Mullenbach (Jr., Lakeville, Minn.) redirected a shot by Emily Skogseth (Sr., Burnsville, Minn.) into the back of the net. Mullenbach recorded her second goal of the season while Skogseth recorded her first assist. The game stayed 1-0 in the Gusties favor until the Knights took advantage of a free kick and knotted the game at 1-1 in the 86th minute. The game would stay tied for the duration of regulation but in the first overtime period Wartburg scored in the first minute to take home the victory. First-year Abby Goodno (Little Canada, Minn.) tallied four saves in the contest but suffered her first loss to move to 2-1 on the year. “We can learn a lot about finishing out a game and finishing our chances when we have them,” said Burnett-Kurie. “Everyday we will get a little bit better and more prepared to start the tough MIAC schedule. The Gusties will next be in action when they head to St. Paul for a non-conference match up with Northwestern on Thursday, Sept. 13 with a start time of 7 p.m.